Beautycounter may not have been around in the late 80’s, but I’m sure the whole Tanner family would have been on board. This company is safe, effective and easy to use. I love the idea of bringing out a woman’s natural beauty…to highlight not only their physical features, but their inner beauty and health as well. Beautycounter allows women to express themselves in a natural, safe, healthy way. Beautycounter gives me peace of mind like most other brands do not. They are completely safe for me and my whole family! The company was started by a wife and mom, just like me, who decided to take action when her eyes were opened to the use of harmful ingredients in so many beauty products. Check out their story here. I love knowing exactly what ingredients are in the products I use on a daily basis and am comforted knowing that my family and I are safe from potentially hazardous substances which are found in so many retail products across the country. Not only is Beautycounter safe, but it also WORKS! The skincare line is gentle, effective and was truly the first product to WOW me. With my combination skin, it can be tricky to find something that actually works, but Beautycounter brought a refreshing balance and radiance to my skin that I haven’t had in years. A few of my personal favorites are the Cleansing Balm and Countermatch Eye Rescue Cream. I highly recommend them! As a stay-at-home working mother, it’s so easy to slip into a routine of rolling out of bed, wearing yoga pants all day and letting my general self-care slip. But, I find that, while I may not need to dress up, I am far more productive and feel better about myself when I take the time to dress my best and put myself together each day. Beautycounter helps me to be excited to get ready in the morning and make me feel “fancy” in the midst of drooling babies and snotty toddlers. Mamas need to take the time to love themselves each day, and Beautycounter has brought that back into my daily routine, not matter what responsibilities are on my to-do list. With that being said, busy moms and women on-the-go need a quick routine to get up and moving. Whether you are tackling an 8am meeting or a mountain of dirty laundry, Beautycounter makes it possible to pull yourself together in 5 minutes or less! I have found all the products to be simple and easy to use, but the Flawless in Five set is especially designed for a quick and easy look that would make Aunt Becky proud. Beautycounter raises awareness to thousands of unregulated chemicals on the market in the United States. 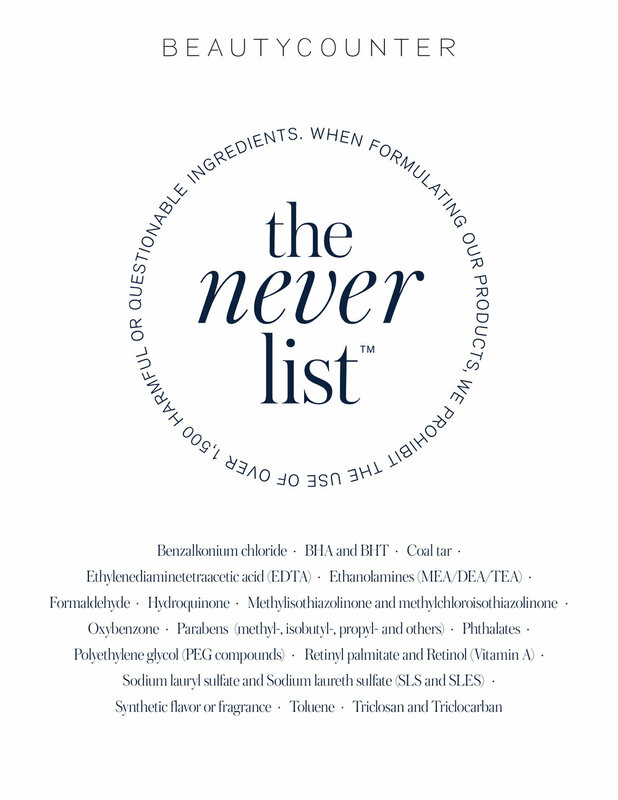 They have a whole list of products called the “Never List” which they have committed to never use in any of their products from makeup to skincare to bath and body products. There are more than 1,500 products on the list which are harmful or questionable but are not currently being regulated by the U.S. government. Are you convinced yet? If you want to take your beauty routine to a new level of safety, quality and ease, check out Beautycounter. I am offering FREE hostess rewards in the month of February!!! To start your love affair with Beautycounter get in touch! Now is the time to join Beautycounter!